A confession: I’ve never seen a production of August: Osage County. Until yesterday evening, that is, when I caught the explosive opening night performance of the national tour’s Chicago engagement, currently playing at the Cadillac Palace through Feb. 14. I don’t know where I was or what I was doing when Tracy Letts’ ground-breaking play premiered at Steppenwolf in late Summer 2007. Out of it, like Weston family matriarch Violet on one of her early morning drugged-out binges, apparently. And I never got my act together to see its triumphant run on Broadway. So, when people were ranking it among their top 10 lists for the decade and citing lines from it ad nauseum on twitter, it was like some elite theatrical club I wasn’t privy to. Sad, sad, sad. But there I was last night, third row center(ish), ready to see what all the hub-bub was about, and eager to end this shameful omission from my theatre-going list. As much as I struggled to remain objective, expectations were mile-high. And after a slow opening, particularly the very first scene, I grew worried. However, the show gradually found its footing, mostly in the second act, and took off. It’s a dense 3.5 hour drama, exploring the complex and extremely dysfunctional dynamics of the Weston family — a rural Oklahoma-based clan of bitter, broken people. Beverly, the family’s patriarch, has mysteriously disappeared, forcing everyone, including the three Weston sisters, to gather at the Weston homestead to support the pill-popping Violet as they await his hopeful return (and silently dread the unthinkable). Deeply rooted family secrets and long-held rage bubble to the surface, coming to an explosive boil — thanks, mostly, to Violet’s caustic and relentless verbal abuse. This cast really delivers. I could go on about them all, but let’s focus on the two leads: Violet and Barbara. I’ve read countless interviews and features about Estelle Parsons’ work ethic and age (she’s 82). The fact that she’s an octogenarian has little to do with her performance: Violet Weston is ageless, as is Parsons. She’s such a masterful actor, grand theatrics aren’t necessary to make an impact. But when she turns it on in act two, watch out. Her voice booms, her finger points, and the family withers around her feet. This is a master acting lesson in restraint and power. The only weak link, for me, is the young actress playing Barbara’s daughter, Jean. Perhaps she was directed to play the role as if she was perpetually high (she liked her weed), but her approach comes off as bizarre and affected — which is at odds with the overall tone. But this production isn’t 100 percent perfect. The Cadillac Palace is far from the ideal venue for this intimate show. Even sitting in the third row, with that moat of an orchestra pit separating me from stage, I felt removed from the action. As a result, the actors had a hell of a time keeping things natural while projecting, and I’m sure director Anna D. Shapiro had her work cut out helping this cast strike that balance — as this tour has been booked into some pretty large theatres. The mic pacs helped a bit, but this piece is much better suited to a cozier space. Also: the fight that ended act two didn’t have the impact I would have liked. I’ve seen my share of authentically staged combat scenes in Chicago shows (this city seems to excel in this arena — we like our violence), so I expected more. And maybe it’s blasphemous to say: but the final scenes leading up to the powerful ending moment seem under developed. Yet, with those minor quibbles, it’s not hard to see why Letts won the Pulitzer. The play is like an onion — you can keep peeling away at it to get to the core, which makes for great post-show cab ride conversation. Aside from the obvious concepts of dysfunction, generational change and family dynamics, the themes that seem to drive most of the action — at least to my theatre companion and me — are escape and avoidance. Pills and alcohol provide an easy means for escape, and we often conceal secrets and maintain lies to avoid the ugly truth. Rather than just ripping it off like a Band-Aid and coming clean, as humans we tend to stamp down our dark emotions so they fester and rot — and eventually consume us. So, yeah, a warm and fuzzy discussion to end a Tuesday night. This is one of those theatrical experiences you CAN NOT MISS. If you haven’t seen this show, go! But be warned: it’s 3.5 hours long, but it flies by. I was surprised by the number of whiny babies leaving the Palace: “I have to be up so early tomorrow!”, “I didn’t know it was THAT long!”, “Why didn’t you tell me it was a nine hour long play?”, etc., etc. 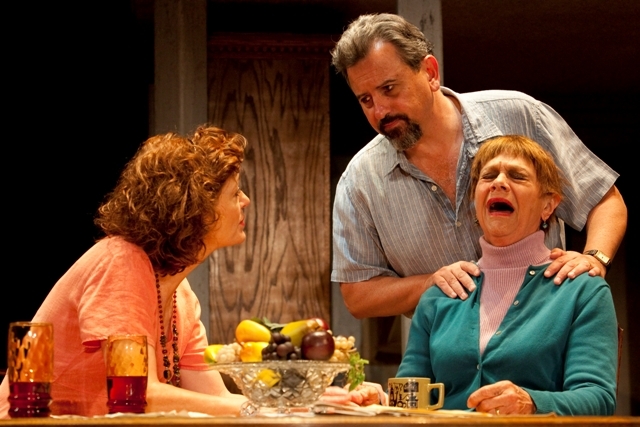 “August: Osage County” plays through Feb. 14 at the Cadillac Palace. For more information, visit broadwayinchicago.com. Too bad you didn’t have a chance to see it at Steppenwolf as Tracy Letts initially intended. Not only was that infinitely more intimate that the Cadillac Palace, but his father Dennis Letts masterfully sucked me into the story completely through his first act monologue. And while I’ll bet Amy Morton’s Barbara could go toe-to-toe with Estelle Parson’s Violet and then some, I’m thrilled to know that Shannon Cochran offers a strong Barbara. Great review. Can’t wait to see the show yet again! Did Amy play opposite Estelle on Bway? I’ve no gauge as to Amy’s performance, since I’ve never seen it, but Shannon was great. Yep. I saw Amy play opposite Deanna, Estelle and Phylicia. The performance of a lifetime. One of the greatest I’ve ever witnessed. So much so I had an easier time accepting other actresses in the role of Violet than Barbara. Hopefully, you’ll have an opportunity to see Amy Morton in another Chicago production in the near future. She’s a breathtaking actress. But now I’m looking forward to seeing Shannon Cochran. Thank you for that! I hope to see her act in a show, too, SOB! Seems she’s focusing on directing, however. When are you seeing the tour? Are you taking in AWAKE & SING at Skokie’s Northlight? Amy Morton is also directing that. I’ll be seeing AUGUST OSAGE COUNTY mid-March. Nope, I’m passing on “Awake and Sing.” Lots to see this month, and going up to Skokie is a bit of a chore. Want to come to Des Moines and review it? Free tickets and you can blog for the Civic Center! It says it’s in January but the show’s here next month? Ha! It’s enticing! You should do it, Lindsey! You blog and are passionate about theatre.